The first edition of the failure five saw two of the five horses mentioned drop off the pathway, Boys at Toscanova and Tapizar. Tapizar ran poorly in the Bob Lewis Stakes and an injury was found shortly after the race, Boys at Toscanova was not training well and was removed from consideration due to this. In light of this, it is time to update the list. The Derby Futures morning line favorite among the entries listed and there is not much to report on this one. Gulfstream Park wrote a race up around the same time as the Tampa Bay Derby in hopes of luring this horse away from Tampa Bay Downs. I’m sure this glorified allowance race will not fill though. The three-year-old debut of this horse will be this Saturday in the Fountain of Youth Stakes; this race produced Eskendereya last year. In related news, Belmont Stakes ticket applications are being accepted now. The only reason this is relative is the fact that for a horse to win the Triple Crown he has to have experience over the Belmont oval, To Honor and Serve has that going for him and the connections go a long way as well. With that being said he will probably either miss the Derby completely or be a tough luck loser in the first leg and run the table in the last two legs. That seems to be the way things go in this sport. There seems to be a recurring theme with this group of three-year-olds, it is that they don’t race much. The top two are still working out and this one will skip a showdown with To Honor and Serve to train up to the Florida Derby. It should be noted that this horse was the co-second choice on the morning line with To Honor and Serve in the futures pool with only two starts to his name. This horse is set up to fall short with this type of schedule, if everything goes according to plan he would make it to the Derby with only three starts and a running style that requires a perfect trip in order to win. Curlin was one of the better horses to compete in the last twenty or so years and he could not pull off a Derby victory with a light schedule leading up to the race, how could this horse be any different? An old angle that has worked almost every winter and spring with the three-year-olds has been that if a trainer ships a horse out of their home base, the horse will be a force to be reckoned with. It struck again this weekend when Mucho Macho Man shipped to Fair Grounds and beat a wide-open field in the Risen Star. Chances are this horse will train in Florida and race again in the Louisiana Derby. 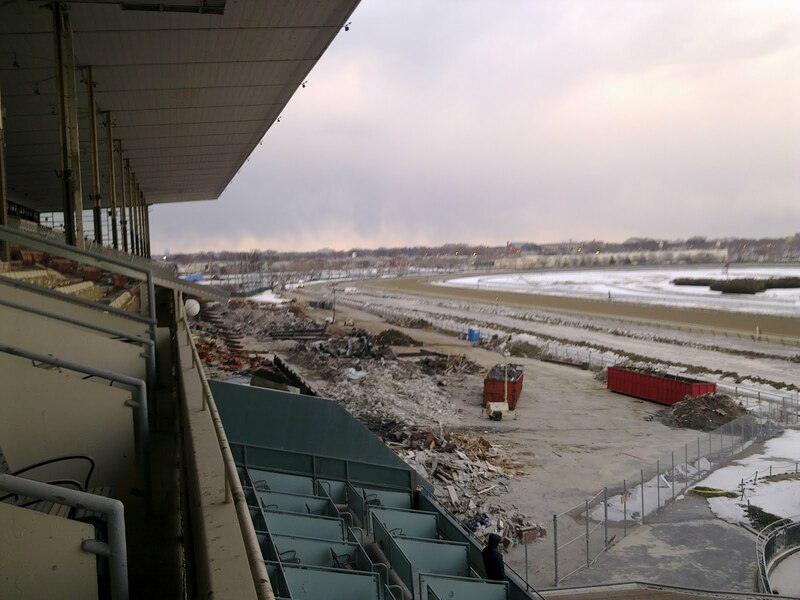 Using Fair Grounds as a springboard to the Kentucky Derby has not been a successful route. The last horse to win the Louisiana Derby and Kentucky Derby was Grindstone back in 1996. One California speedball gets knocked out of the frame only to get replaced by another. Baffert has not stated that he is aiming this one for the big dance, but seeing how it is a three-year-old trained by Baffert it is a safe bet he will take a shot at this with a race going two turns in the near future. Two races Baffert cited the Sunland Derby or the Rebel Stakes as possible next starts. This is an auspicious first time start. The first sub 109 six furlong race since 2005 at Fairgrounds. This one has the movement to be a great one. Combine they with top connections and graded stakes is just a matter of time. With today's training style I don't think the triple crown is out of the question for Bind. Uncle Mo better be on his game when he tangles with this one. 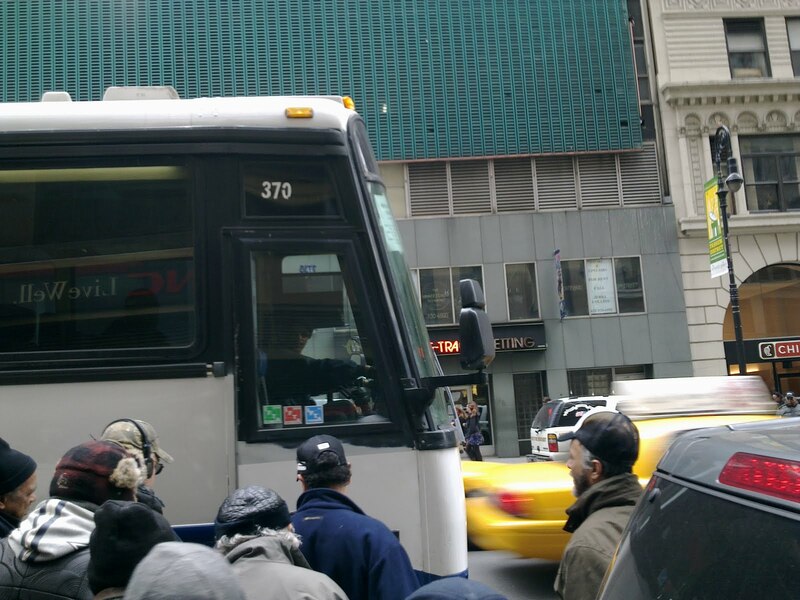 In post OTB New York City NYRA is providing free bus service from former OTB locations to the venerable Big-A. 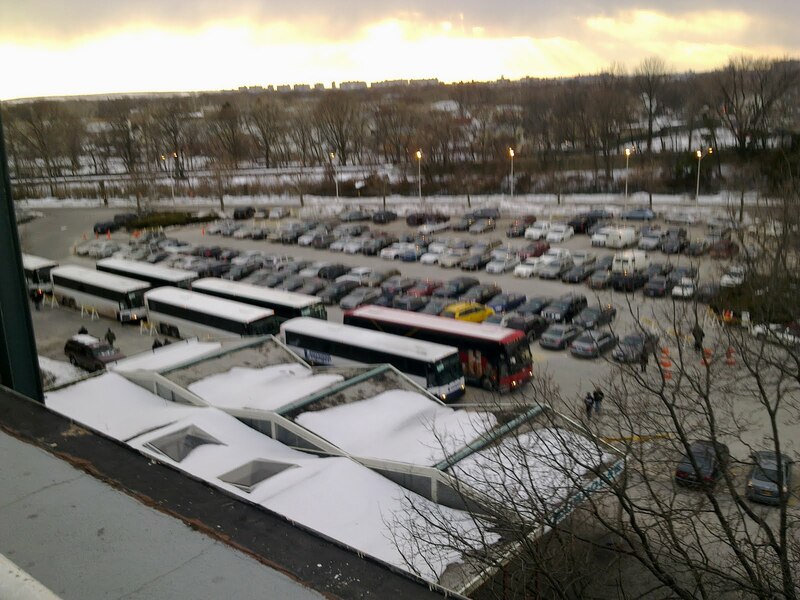 On the warmest Saturday in ages -downright balmy at 35F- I decided to take advantage of NYRA's generosity and use the free bus from midtown Manhattan to the Big-A. This is a bus like no other; it is like someone returned from a time warp and dragged a busload of working class NY residents from 1982 with them. In a city increasingly becoming a Bauhaus playground for the wheel-heeled this crowd was a quite the contrast from the typical mid-town Manhattan crowd. 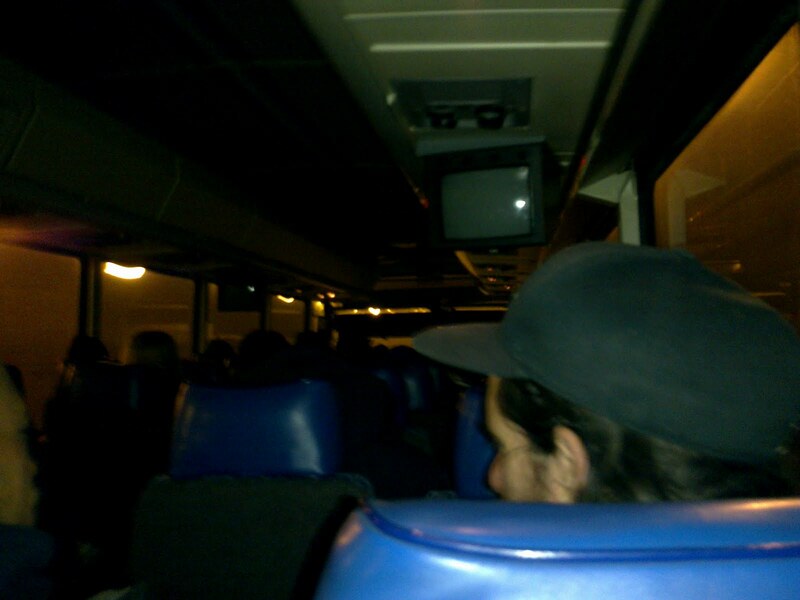 Almost all on-board were working class men in their 50s to 80s. On the way back one of them was so tanked he fell over on the way to his seat. 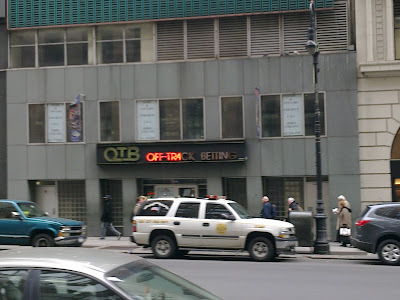 Perhaps it is not a coincidence that this working class element has slowly been disappeared from NYC and now one of their favorite haunts has also been shuttered. Aqueduct itself looks like a post WWII site in Dresden after absorbing the wrath of the Allied war machine. Conducting a sporting event at a venue in this state of disrepair is a surreal experience. 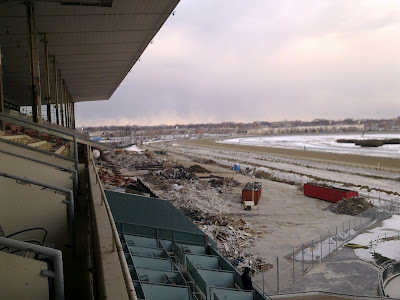 The entire third floor grandstand and apron is shuttered while festooned with a large lot of construction/demolition debris. Would ball sports play in a stadium that looks like this? 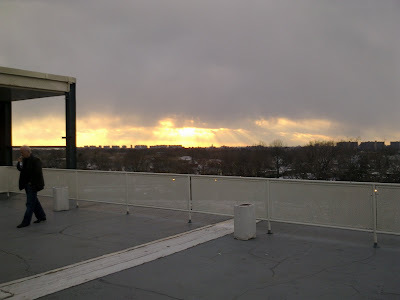 Our observations make it obvious that the casino construction is far from ready; the slot playing blue-hairs are going to have to wait much longer for their VLTs. Last week Greg went down south to Gulfstream (lucky) and I trekked out to the Belmont simulcast. Mostly for two reasons, the first was you can only go to Aqueduct so many times in a month before the charm wears off (for other people it is one trip in a lifetime) and curiosity, Belmont's clubhouse was opened to take up the slack that the NYC OTB left behind. 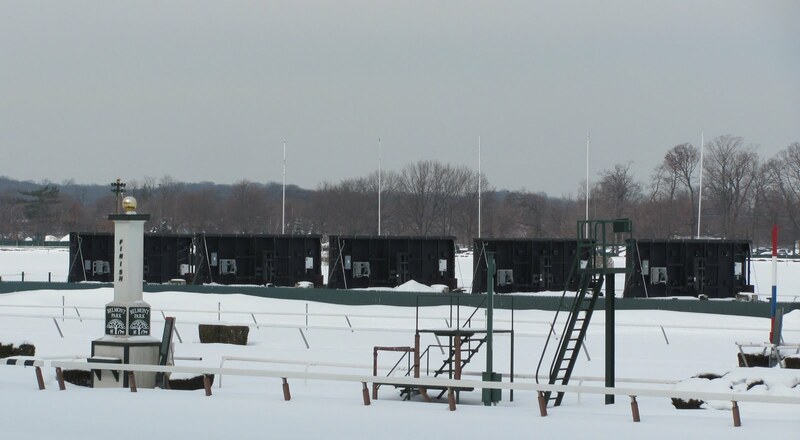 Apparently the heating for big sandy's clubhouse wasn't quite up to snuff so NYRA had to bring in some kerosene heaters to keep the betttors warm and cozy. Ever wonder what they do with the Secretariat statue in the paddock during the winter? Wonder no more, much like a museum exhibit it is boxed up and preserved when not on display for the public. It must be a massive operation to get the odds board ready for winter inactivity as evidenced below. Belmont's grandstand is big, cold, and empty during the winter. 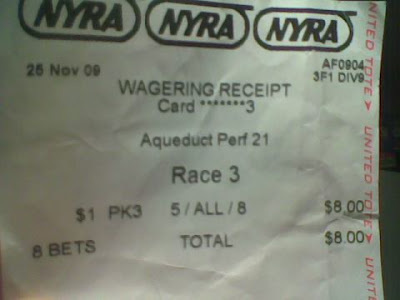 Every once in a while a politician or newspaper editorial raises the point that Aqueduct's property should be sold to developers and Belmont be made into a primary racing center for the year in New York. Just from touring the closed off grandstand this would not be wise. The heating issue is the primary reason, the surface change over to a winterized surface or building an inner dirt surface inside the turf course is another issue, and the track maintenance of this massive oval during the brutal winter months would probably be much more than what they are spending at Aqueduct right now.